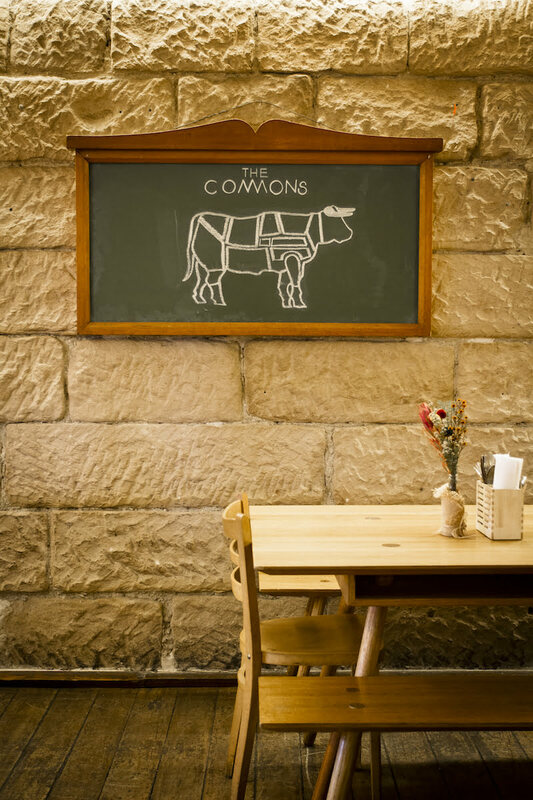 A foodie worth his or her salt in Sydney would already be familiar with Darlinghurst farmhouse-inspired restaurant, The Commons Local Eating House. Only a short walk from Oxford Street, doors first opened back in 2010. And despite a recent change in head chef, the emphasis of the menu is as it’s always been, on seasonal, fresh and sustainably-sourced ingredients. The eatery supports Sydney producers wherever possible. Even the name itself, ‘The Commons’, refers to the “shared environmental and cultural resources of a city”. Taking over the reins as Head Chef is Peter Coyle, formerly of Fix St James and The Bach Eatery. 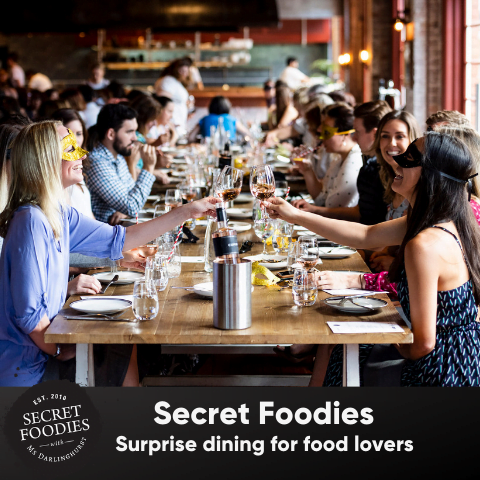 Professing a “love [for] making good, honest food”, he’s infused the new menu with his particular take on hearty and innovative fare. And the results are spectacular. This is European food with a mod Oz twist. 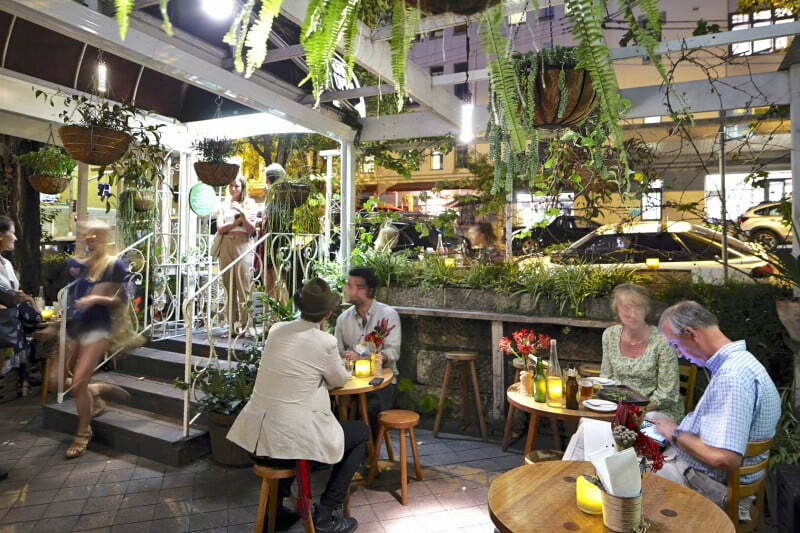 Hanging pots and greenery greet diners in the front courtyard and welcome them to what is perhaps the cosiest and warmest venue in the city. Surrounded by the exposed sandstone brick of the convict-era farmhouse, it is hard not to be drawn to the open fire. We immediately feel snug and relaxed, as we take a seat at one of the many elegant, Scandi-inspired timber tables. 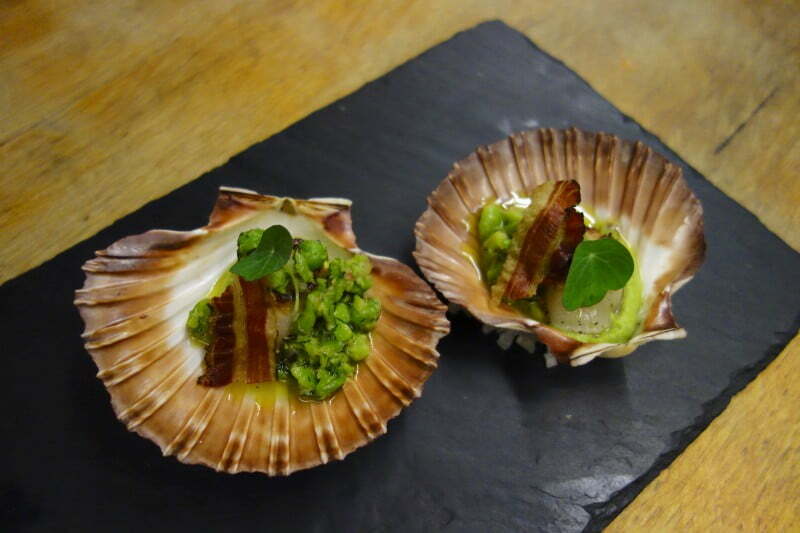 We start our meal with seared scallops with broad bean puree, crushed pea salsa and crisp pancetta ($21). Drizzled with Adina Vineyard olive oil from the Hunter Valley and served on a slate platter, the bite-sized entrée bursts with flavour. It is a superb introduction for the confident and adventurous flavours and pairings to come. 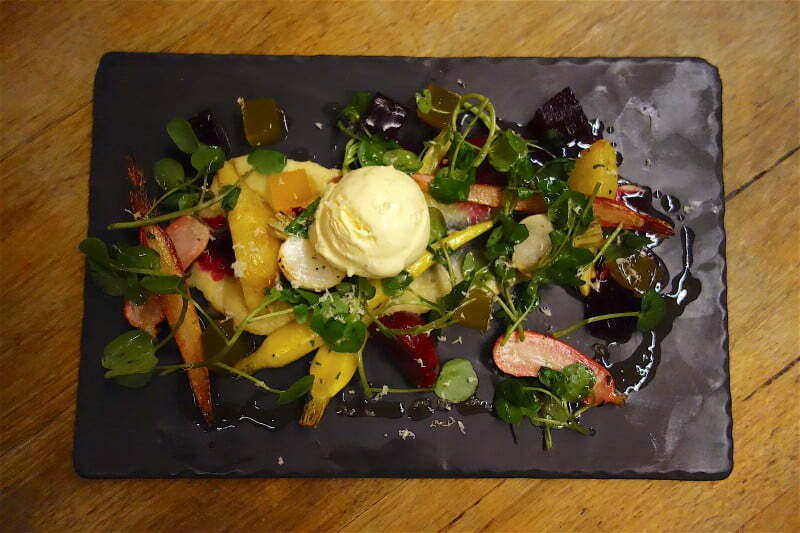 The special on the night is the beetroot, carrot and parsnip salad with both beetroot and golden beetroot jelly, and topped with a scoop of horseradish ice cream. With such an unusual combination of ingredients and textures it is almost a certainty that you have never had a salad like this. And surprisingly everything works. Visually it is also thrill. The hard crunch of the pickled vegetables is balanced by the jelly and melting softness of the ice cream, and the pepperiness of the greens by again the sweetness of the ice cream. It would be downright criminal if the dish never made its way to the main menu. It is just that delicious and unique. 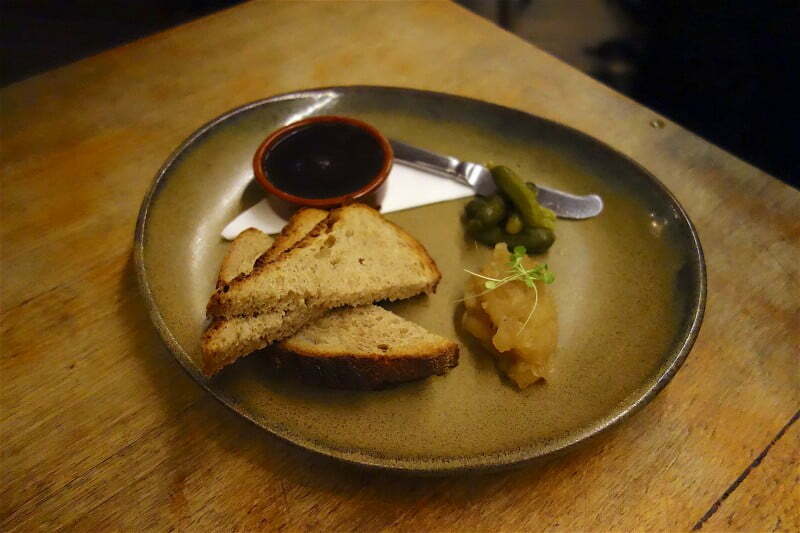 Next up is the duck liver parfait with port jelly, lightly toasted bread and pickles ($11). Flavourful, creamy but somehow quite light, the parfait is all kinds of melt-in-you-mouth ambrosial. It is so very easy to eat! 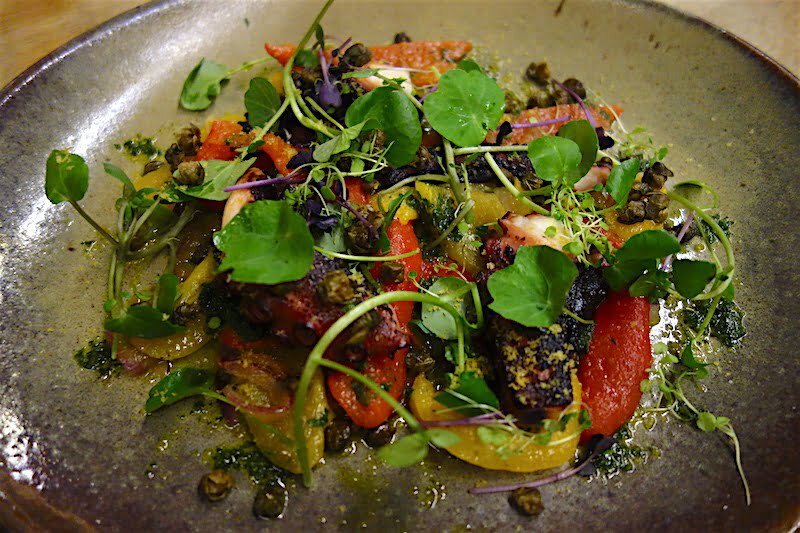 The slow cooked octopus ($24) is sustainably sourced from Fremantle in Western Australia and delights us with peperonata, bottarga, nasturtium and baby leaf. This Italian-influenced dish goes well with the slow-cooked capsicum and pieces of chargrilled octopus. A very generous plate indeed. 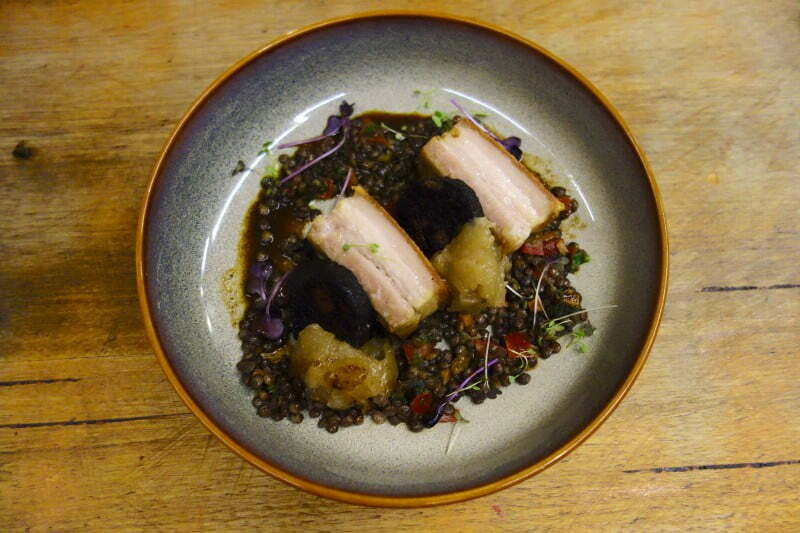 Lovers of pork belly will not be disappointed by The Commons’ free range, crispy skin version with lentils, black pudding, and cider braised apple. A rich and densely flavoured dish, there is much to savour and enjoy. However the highlight was the black pudding. Salty and meaty it was quite the revelation. Coyle’s pièce de résistance is the ‘osso buco’ ($32). 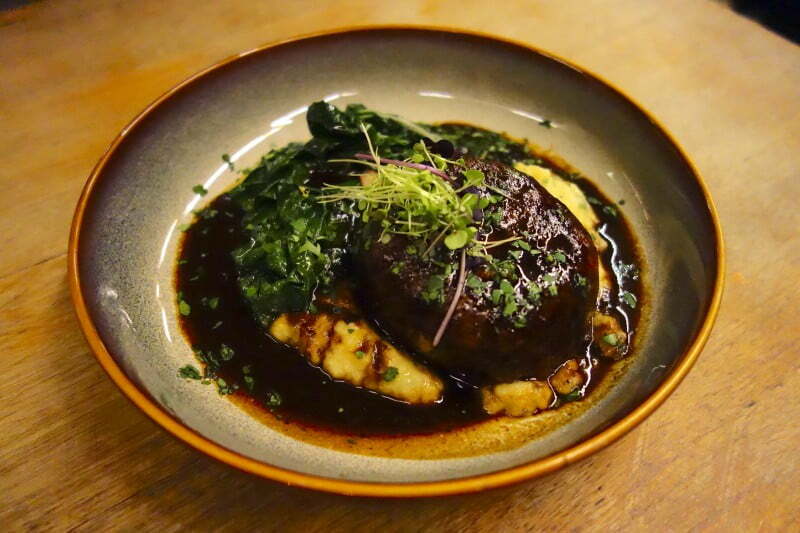 This deconstructed dish is created by combining 18-hour braised Wagyu shin with roasted bone marrow, placed on a bed of soft polenta, silverbeet and gremolata. It’s difficult to understand why you’d play around with the traditional method for making osso buco when the results taste very similar. However, it is homely and comforting, perfect temperature-raising, winter food. Capping off the night is an impressive selection of desserts. Sweet tooth foodies rejoice. A mainstay of The Commons’ menu is their cinnamon donuts. Tonight these wonderfully doughy parcels were drizzled with chocolate. Divine. The dark chocolate tart with whipped cream and strawberries also enchants. However the white chocolate creme brulee with lemon sorbet is a little too sweet and too sour after such a breathtakingly sumptuous and creative meal. The Commons is that rare restaurant that combines intimacy with bold, imaginative ideas and consistent quality. It is a thrilling mix. 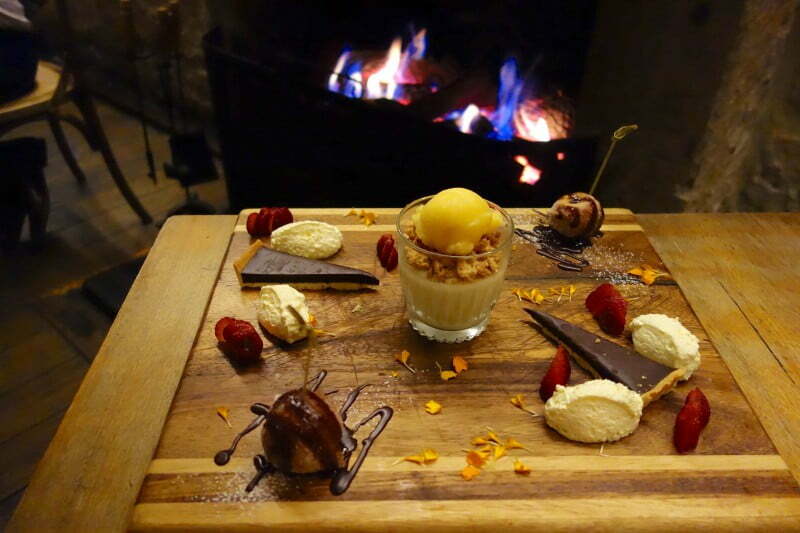 Setting up in front of one of the dining room’s roaring fires is the ideal spot for a warming, winter meal. Do yourself a favour and revisit this gem of a local. After dinner head downstairs to Downtown Bar for some award winning cocktails and late night jazz. 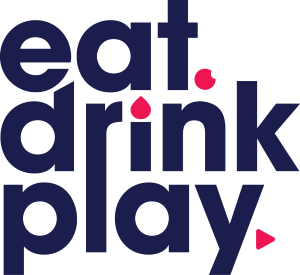 If you’re in the area and bar hopping, why not check out Della Hyde? It’s a short stroll away from The Commons.